Newspaper Advertising as a Marketing Strategy – Dead or Alive? A lot of people think that local newspaper advertising is dead. I believe maybe the advertisement needs to be killed off rather than the medium. A case in point this week…. a client opened a new clinic in Mornington Victoria. He took out advertising in a Mornington local newspaper but didn’t get any enquiries from it. His target market would read the local newspaper so the medium was correct. I had a look at the advertisement and I saw a problem. There was no compelling call to action, there were too many words and the photo used blended into the paper and didn’t stand out. So I changed the copy, put an eye catching photo in, a strong call to action “call now for your free consultation” and bingo! With new life put into the advertisement using sound marketing principles results were achieved. Even though the ad was on page 18 the phone rang and sales around $5000 were made! Return on investment $5000 on $625 investment. LIKE WHAT YOU READ? SIGN UP TO RECEIVE LATEST INSIGHTS. Is the customer always right? You betcha! Would 100 Bright Ideas help? Run out of marketing ideas? 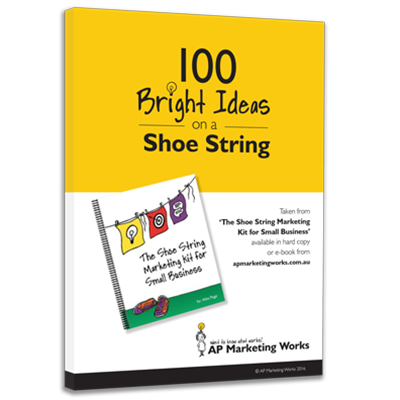 Before you go, download our 100 Bright Ideas on a Shoe String. Please provide your name and email address so we can send you your free checklist! Your freebie has been sent!